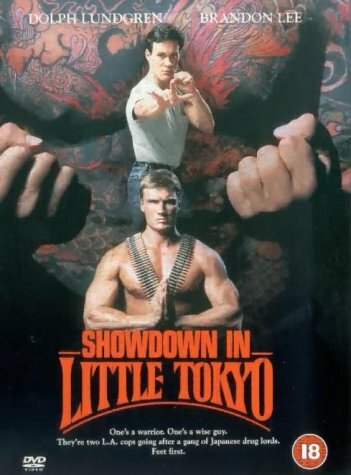 Showdown in Little Tokyo is a 1991 martial arts action comedy which, in pitting Dolph Lundgren and Brandon Lee as LA cops against Japanese drug dealers, plays like a B-movie Tango and Cash or Lethal Weapon 2 (both released just two years before). Between career highs in Rocky IV (1985) and Universal Soldier (1992) it looked as if Lundgren might make it big at the box-office, and clearly wanting to be the new Schwarzenegger he is here directed by Mark L Lester, who had earlier helmed Arnie's Commando (1985). In the event both actor and director headed for straight-to-video territory. The 75-minute running time suggests the studio lost confidence and seriously cut the movie though, as the space between the action is filled with nothing but cringe-inducing dialogue, thriller clichés and Lundgren "romancing" Tia Carrere, it still makes sense. Basing its title on John Carpenter's 1986 fantasy-comedy Big Trouble in Little China and anticipating Rush Hour (1998), Showdown in Little Tokyo alternates between crude tongue-in-cheek moments and action so ludicrous it's unintentionally hilarious . A camp disaster which simply defies belief, this is stupidly entertaining so-bad-its-good six-pack entertainment.